Verifico — How Do I Withdraw My Funds? Support Home Knowledge Base Knowledge Base for Experts How Do I Withdraw My Funds? Before you will be able to withdraw funds you will need to link your bank account to your Verifico account. The first step to doing that is filling out this form with the information for the account you wish to link. Once you have completed this form we will have to verify your account. Two deposits of less than $1.00 will be made into your account within 1-3 business days. You will also receive an email to verify your account. Enter the two deposit amounts into the link provided in that email and your account will be verified. Once your account is linked you will be able to withdraw funds. You can do this, and check your account balance by going to the PAYv tab on your dashboard. Your balance will appear in the upper right hand corner. 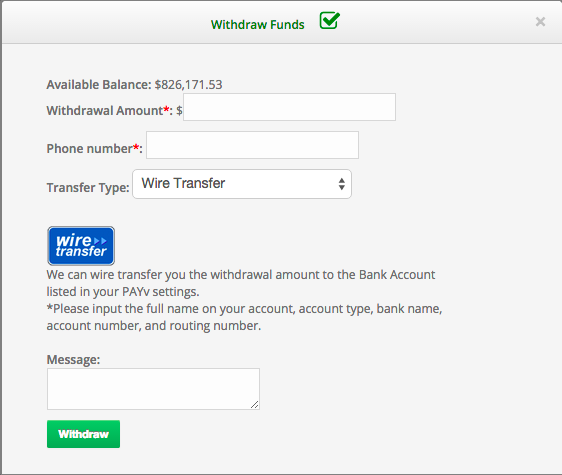 There will be a green button below your balance for withdrawing funds.